When Kiko Uliana and Jose Antonio Baggio decided to put up a hardwood flooring company in Brazil during the 70’s, they had only one thing in mind: to become the global leader in the exotic wood flooring industry. As of today, their mission is said to be completed as their main brand, IndusParquet Flooring, is now being exported in more than 25 countries. For its remarkable quality, IndusParquet flooring been used in showrooms of leading brands, such as Ferrari and Louis Vuitton. Not only does IndusParquet flooring offers high quality exotic materials, their company is also certified by the Forest Stewardship Council for being able to sustainably harvest exotic wood species that they use from their own reforestation plantations. Because of the quality performance that IndusParquet has to offer, it has penetrated the US market 20 years ago. It is currently being distributed by Wood Floor Planet. 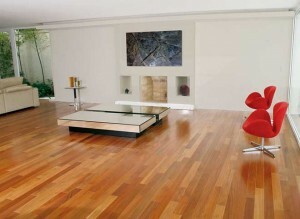 Wood Floor Planet NJ has in its showroom the following collection from IndusParquet Flooring. The Smooth Exotics collection offers high quality floorings that have the smooth and sanded look. New Jersey homeowners can choose from Brazilian Pecan, Tigerwood, Timberana, Imperial Chestnut, Golden Maple, Brazilian Rosewood and American Cherry wood species. For homeowners who want to have more personality on their hardwood floors, the Textured Exotics collections offer wood species such as Brazilian Chestnut Ebony, White Oak and Patagonian, Amendoim among others. The coating process, which is done by Induro Aluminum Oxide technology makes it possible for the hardwood floors to have a textured finished and yet withstand scratching and abrasion for generations to come. For New Jersey homeowners who prefer the more rustic look and want their hardwood floors to have a certain patina in them. The Metallic Exotics collection is just the collection for them. Choose from Brazilian Golden for a golden patina or silvery glow with the Brazilian Gray. For homeowners who like their flooring to be made up of an assembly of small blocks, IndusParquet offers the Mosaic Exotics Collection. Homeowners can choose from square or line designs or combine both to have the unique and stylish floor of their dreams. Mosaic exotics can also be used on walls. Having a beautifully styled exotic hardwood floor will not be completed if its surrounding walls do not correspond to it. The Wall Exotics collection offers homeowners materials that will help accentuate and match your floor’s texture and over-all design.